What’s Your Money Doing Tonight? The nature of money is to abstract value. That is its role. It stands in place of an actual good or service. If I fail to have the basket of potatoes you are seeking in exchange for the wool from your sheep, I can instead pay for the wool in dollars or BerkShares or Brixton Pounds— which then become an abstract representation of the wool. You can then exchange those $, B$, or B£ at a later time in the market for potatoes, or for any number of other products or services. This capacity for abstraction is an advantage. It means our transactions are not limited to a particular time and place. But the abstraction is also a disadvantage when exchanges occur outside a place-based economy. In the global marketplace we easily lose track of what our money is doing, of what it is enabling. The bundling and then dividing of investments, a common practice used by large financial institutions, further separates individuals from knowing the actual projects funded by their monies. Alongside the accumulation of money is the responsibility to spend, invest, and gift it in an accountable way. When money is spent into the local economy there is greater visibility of how products are made, by whom, and under what conditions. Local currencies help facilitate that transparency. 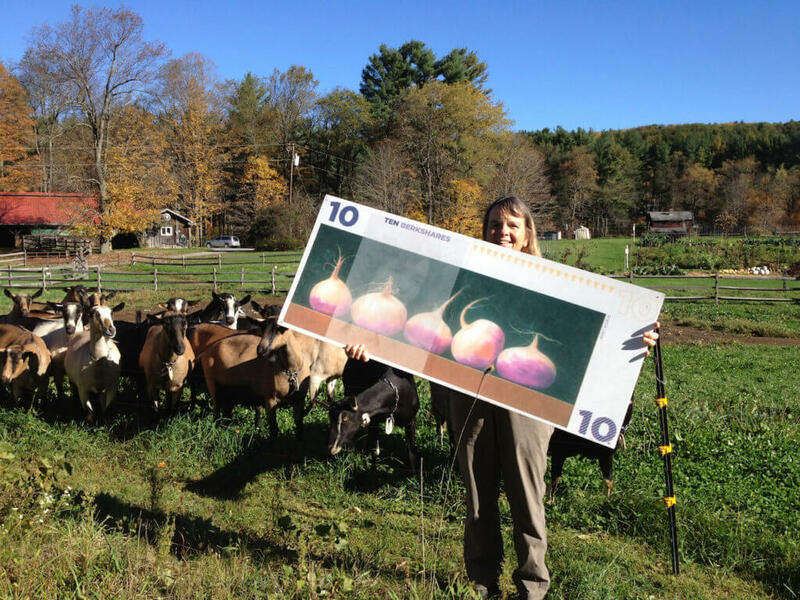 Susan Sellew, owner of Rawson Brook Farm. A number of local micro-lending initiatives help direct investment capital into projects known by the investor. 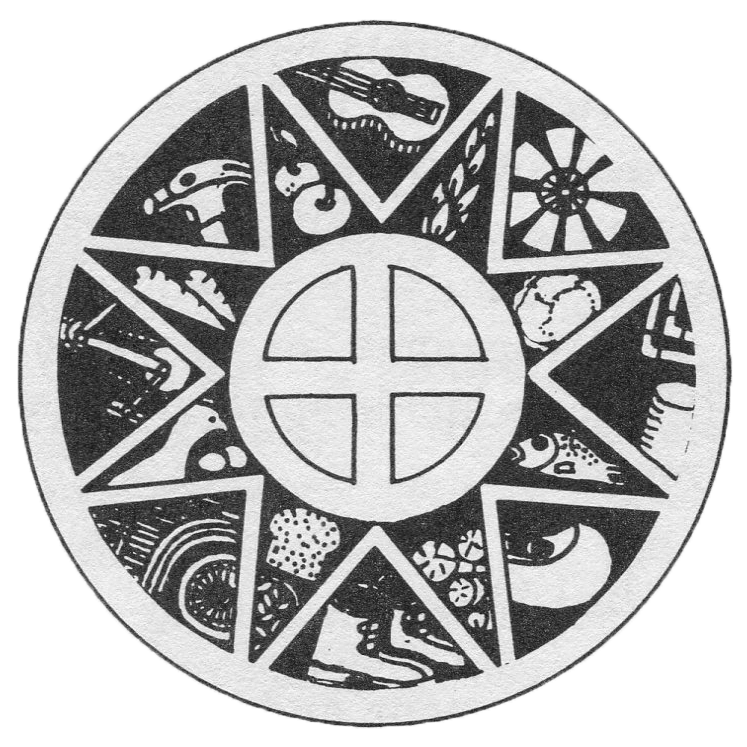 One such is SHARE (Self-Help Association for a Regional Economy), which was active in the Southern Berkshire region of Massachusetts from 1981 to 1992. SHARE worked with local banks to provide collateral for small loans that would not normally receive bank financing. Members of SHARE opened Certificates of Deposits (CDs) at a local participating bank. They were written as joint accounts with SHARE. The funds, and interest earned, remained owned by the depositor, but SHARE retained the right to use the CDs to collateralize loans that met SHARE’s social, ecological, and financial criteria. 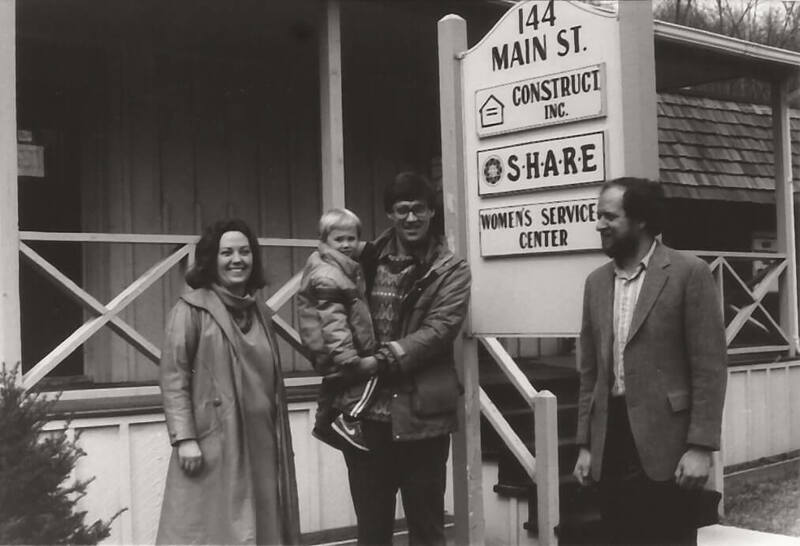 Susan Witt, Peter C. Webber (State Senator for Berkshire County) with his son, and Joe Savage, founding board member of SHARE, in 1985. The bank made the loans at the suggestion of SHARE’s board of directors. SHARE did not hold funds, nor make loans, nor collect payments— that was all a function of the bank. SHARE had a post office box, a file drawer of pre-signed collateral agreements, and a folder of loan collateralization requests. It had a very simple overhead and operation. Essentially SHARE separated two functions of banking. Banks are reliable accountants of our deposits, withdrawals, and transfers— a very detailed and relatively conservative function. At the same time banks are arbitrators of what projects in the community receive funding— a risk-taking function. SHARE placed the risk-taking role into the hands of community members, and the detailed role of accounting was left with the bank, which was a local institution with proven skills in this regard. Through regular letters to members, SHARE depositors learned what their money was doing tonight— whether in the new milking room at Rawson Brook Farm, or in a barn for a working draft horse team, or in a bulk supply of material for a family making kites, or in a piano for a piano teacher, or in tools for Indian Line Farm. All of these were productive loans that enabled more products or services in the community than the value of the loan itself. 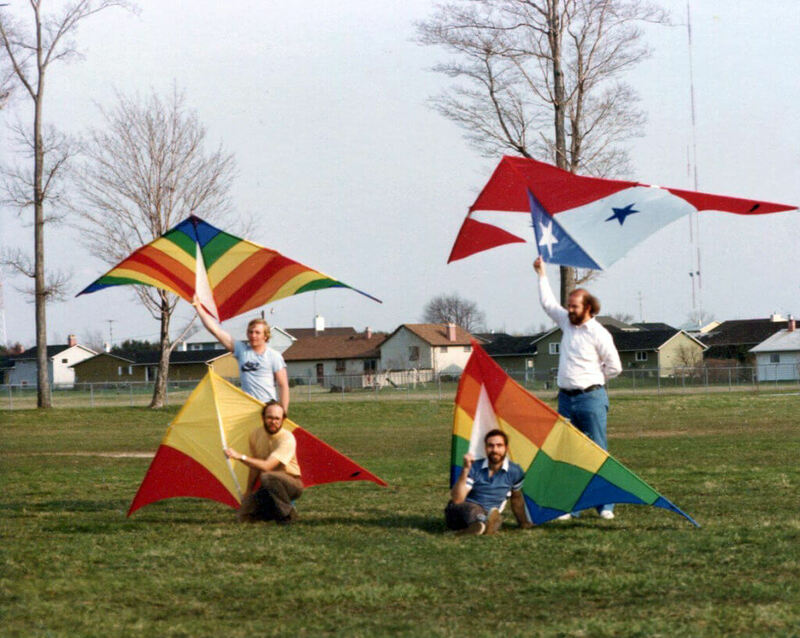 Kites of the Four Winds. SHARE members asked for Monterey Chèvre at area restaurants, rooted for Spike and Goldie at the draft horse pulling competition, chose one of the colorful kites for a birthday present, and purchased a share at Indian Line CSA— and in doing so supported the businesses. The repayment rate for the 23 SHARE collateralized loans was 100%, which was in part due to this advocacy. Sample legal documents for starting a SHARE program are online for easy replication. The program could be shaped to focus on food related businesses, or minority owned, or youth initiated, or other criteria judged important for the health of the local economy. Always searching for ways to support her hometown Philadelphia economy, Judy Wicks created a local investment club. Called “Circle of Aunts and Uncles,” entrepreneurs meet Circle members over a good meal, build trust, and pitch their projects. Bring your money home by spending, giving, and investing locally! Our thanks to Martha Shaw for her original drawings for the SHARE program. Martha turns ninety this week and is being fêted by friends in her community land trust neighborhood of Forest Row. Martha donated her collection of books on simple-living and self-reliance to the Schumacher Center’s Library where titles may be searched online.